Danny Lee Chilton and his wife, Suzanne Rayfield Chilton, seek to carry on family traditions of community service. As "Volunteers-In-Parks" at the Ozark National Scenic Riverways, Suzanne tells Stories of Civil War in the Ozarks. The stories are based on the memoirs of John J. Chilton, "True Tales of Bygone Days" published in 1930s newspaper, "The Current Local", in Van Buren , Missouri. 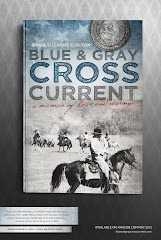 "Blue and Gray Cross Current" formats include historical fiction novel, storyteller, and musical drama. Dan and Suzanne spent their childhood in Shannon County Missouri and returned in 2004 upon retirement from careers in engineering and information systems. With their sons, Mark Danton and Stephen Rayfield, they resided in Illinois, Tennessee, and Missouri. Political Heritage: the Thomas Boggs Chilton family settled Ripley County Missouri in 1818. His daughter, Clementine and Zimri Carter also settled what later became Carter County. "Boggs" first cousins, brothers Thomas Coot Chilton and Truman Chilton families settled the area in 1834. Thomas Boggs Chilton began the family political legacy in 1834 as state representative when Ripley County encompassed most of Southeast Missouri. Carved out of Ripley, Shannon and Carter County family legislative terms were held by John in 1840, 42; Joshua in 1846-54, 58, 60; David Clinton Reed in 1856, 69, 80; George F. in 1870-76, 98; Perry in 1886, 92; Shadrach in 1906, 1910. Dan's maternal family legacy includes legislators Lemuel N. Searcy in 1926, 34, 38; Robert Emmett Searcy in 1936-44, Donald Danton Searcy in 1948, 50. Suzanne's family includes Reynolds County Representative Col. Lucian Nester Farris in 1858 and 1876. Military Heritage: In 1776, Mark, Stephen, James and John Chilton served in the Continental Army of the Revolutionary War in the combined militias of Maryland and Virginia. By 1860, The Chiltons of the Civil War Era numbered about 100 souls, where they lived on riverbottom farms along the Current and Jacks Fork Rivers in the Missouri Ozark Mountains. Sons and sons-in-law served in both Union and Confederate armies, and included accused bushwhackers and distillers. Mark Chilton, Thomas "Boggs" Chilton, Thomas "Coot" Chilton, Colonel Thomas Roe Freeman of Freeman's Regiment, Senator Joshua Chilton, and Perry Chilton are Dan's direct ancestors. Colonel Lucian Nester Farris and Private John Carter Rayfield, both of Farris Company, Clardy's Regiment are Suzanne's direct ancestors. Careers: After graduation in 1965 from Missouri School of Mines at Rolla, MO, Dan began his engineering career with the State of Illinois as a civil engineer in the Department of Transportation’s bridge design group. He became county engineer for Henderson County Illinois. In 1979 he became a consulting engineer in private practice with Hensley Schmidt Consulting Engineers in Tennessee, and with WVP Engineers, Architects, Planners in Illinois and Missouri. As President and CEO, he led WVP to merger with URS Corporation. Since retirement, Dan served on several community boards. Dan enjoys golf, fishing, canoeing, gardening, and especially, St. Louis Cardinals baseball. After attending Southwest Missouri State University and graduation in 1970 from Illinois State University in Normal, IL, Suzanne began her information systems career with Franklin Life Insurance Company in Springfield, IL. She was a fulltime homemaker and mother in 1973, reentering the workplace with Illinois Power in Decatur, IL in 1981. At Illinois Power she began as a computer programmer, then served in management and system-owner roles. With Dan’s career move to St. Louis in 1994, Suzanne completed a Masters of Information Management at Washington University School of Engineering. She was a business process and systems consultant with Peabody Energy, then with SAP America. Suzanne enjoys golf, gardening, canoeing, fiber arts, piano, and her computer for research and writing. She and Dan are members of the State of Missouri Historical Society, Ozark Fiber Artists Guild, Shannon County Museum Assn., Eminence Area Arts Council, and South Central Missouri / North Central Arkansas Civil War Roundtable. Home: Our biography is not complete without understanding the uniqueness of Shannon County. Geographically the second largest Missouri county, the total population is 8,500. Federal and State Governments, and private timber companies own the bulk of the land, with the National Park Service Ozark National Scenic Riverways spanning all the former river-bottom farms along the Current and Jacks Fork Rivers. Sociology and history professors write doctoral thesis and produce documentaries about the remote land and its cultural heritage. Abundant in beauty and natural resources, more than a million tourists visit the area each year. We have a wonderful cultural heritage to share. Come by the hills and enjoy a story or two.